Download a printable PDF of the flyer. 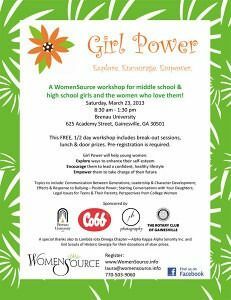 Girl Power is free and open to anyone who would like to attend. Attendees do not have to be members of WomenSource. The workshop includes break-out session, lunch and door prizes. Pre-registration is required by Tuesday, March 19, 2013. For more information or to register online please visit www.WomenSource.info.